Found this while searching google images for electric cars. Searched on here and did not see it so I though I would share. Thought it would make a nice coast assist motor if nothing else. Did some math on these for a 155/80 12 like on my car. Those motors do look interesting. The main thing I usually hear about hub motors for use in a car are questions about "sprung weight" since the weight of the motor is on the road instead of in the engine compartment, held up by the suspension. Pretty cool that you can get ones that already have brake discs on them. Range of voltage isn't bad either, they have 48-96V versions. 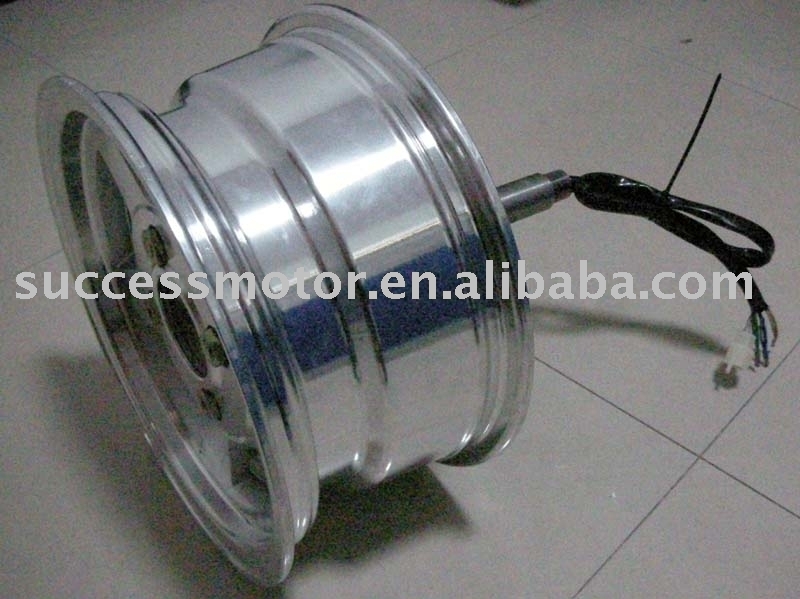 My other concern is that they say "brushless DC". I know brushless controllers start to get a little on the fancy side (price!) and you would need one per wheel, so two controllers at a minimum. I am not sure how turns would effect the power/signal, etc going to the wheels either. I would think that you could have one potentiometer sending the same signal to both motors, as long as everything is identical - exact same motor with same settings. I really neat advantage of hub motors is that you don't need any room under the hood for the motor. Put two of these on the back of a Metro or Festiva, and you got a hot hybrid!!! Yeah, used on the rear wheels as a hybrid would be pretty slick. Get up to speed, turn on your wheels and kill your engine... Wheel motors were used on the 600+hp electric BMW Mini that was posted before. 10 kWatt!!! That's plenty! It's what my car is right now, and for in town driving, it has perfectly good acceleration. Plus, those brushless motors handle extra power just fine. They just get a bit toasty, but they'd be blowing in the wind, staying nice and cool. That's some fancy math you've got there. Glad to be in the shadow of such genius. It's not a problem. As long as it's not my 8's I can add any pair of numbers from 0 to 9. So, feel free to let me know if there are any questions... For example, if there was a hub motor that was 9 kWatts, and another that was 5 kWatts, I could hook a brother up. Have you guys seen the hub motors built in Italy for some GM prototype that were like 20 kWatts EACH! Where the crap are those??? I remember their grand plan was to use the hub motors only to improve acceleration of their gasoline car! Such vision! 20/200 vision. Did they sell the technology to Cobasys? Oh No! I just wrapped copper around a nail, and hooked it to a battery. Quick, arrest me for patent infringement! haha! Or backwards of this use efficient electric to accel then bump start car and cruise with gas at high MPG. Let the electric do the bad mpg stuff accel, stop and go, etc. You may even be able to sneak through a drive-thru once in awhile. I like the simplicity of these as well. And I see you and me had same math teacher. Why doesn't someone do something similar that is retro fittable to current cars ie, a 14" rim with the brushless motor built in the outer rim even if it required low profiles to fit, or alternately offset outwards, thus allowing any car to become a hybrid by just replacing the wheel and wiring up, even brake regen could be built in. Would particularly suit FWD's and replace the rear wheels. because its not that easy.